Student Council Field Trip – December 2017. On Friday the 15th of December the R.a.L.E.T student council went on a trip to the Dáil and the Ombudsman. First we got the bus into town. Then we hopped off the bus and walked the rest of the way to Leinster house. When we got there, we took some pictures – someone’s Dad met us to take some photos. Then we went into a room where we had to take off our bags and put them in to a box. Our things had to go through a machine that scanned them to make sure we didn’t bring any stuff we weren’t supposed to bring…we also had to walk through a another machine to scan us. Then it was time to meet our tour guide who showed us around the place. First we went to the Dáil Chamber, where we sat above all the politicians who were in the dáil. In the Dáil they were talking about homeless children – but there wasn’t too many people there, which was a bit disappointing. After that, we went into the hall where there were pictures of all the previous taoiseach. The tour guide spoke to us a bit about them. After that, we went into another chamber where they were talking about children using social media….and that was the end of part one of trip! We walked back to the bus, after collecting coats and bags. Next up was the Ombudsman for Children! The first thing we did when we got in was eat our lunch as we hadn’t had anything to eat since breakfast and we were so so so hungry! After we had eaten our lunches we took off our shoes and went into an area where there were lots of bean bags. We played on the bean bags for a while (they were super cool!) and then we went into another room where we watched some videos clips and chatted about the Ombudsman and about Children’s Rights. This was followed up actually meeting the Ombudsman for children, a man called Niall. Then when we finished talking to the Ombudsman we were given a piece of paper with a hand. On the hand we had to write down all the names of people who help us. Then when we finished the hands we got a sticker sheet (these were stickers of all the children’s rights) and a piece of paper with different people in our lives on it and we had to match the stickers with the rights…and that was the last activity that we did! It was a busy but really fun day! 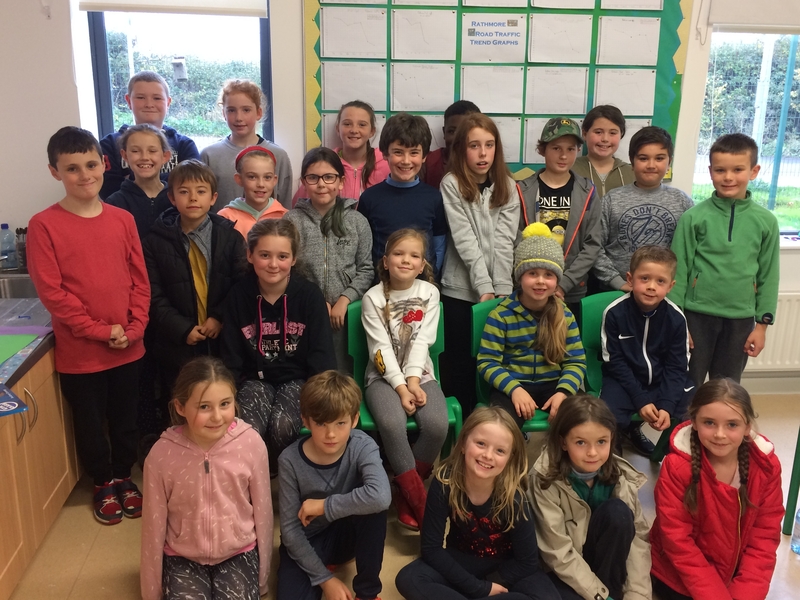 This is a photo of the 24 children who are on the Student Council this year. It’s a big group – two from each class. This term, we’ve focused on the yard and are having a fundraiser during the last week of term for yard equipment. The Seniors will be doing a Skip-a-thon, and the Juniors will be doing a Penalty Shoot-Out against Santa and his elves! We are also going on our first ever Student Council Tour in December. We’ll be visiting the Dáil and the Ombudsman for children…and we can’t wait! Watch this space for more information!